Adaptive star grammars generalize well-known graph grammar formalisms based on hyperedge and node replacement while retaining, e.g., parseability and the commutativity and associativity of rule application. 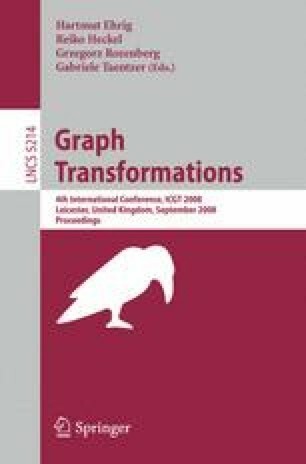 In this paper, we study how these grammars can be put to practical use for the definition of graph models. We show how to use adaptive star grammars to specify program graphs, models of object-oriented programs that have been devised for investigating refactoring operations. For this, we introduce notational enhancements and one proper extension (application conditions). The program graphs generated by the grammar comprise not only the nested composition of entities, but also scope rules for their declarations. Such properties cannot easily be defined by meta-models like Uml class diagrams. In contrast, adaptive star grammars cover several aspects of class diagrams.